Don't think that you have to spend thousands of dollars to launch your podcast! I give you some tips for podcasting decently with the cheapest equipment. I already blogged about it, but here's a newer screenshot now showing The Audacity to Podcast™ as #5 in “New & Noteworthy” on iTunes' front page of podcasts. 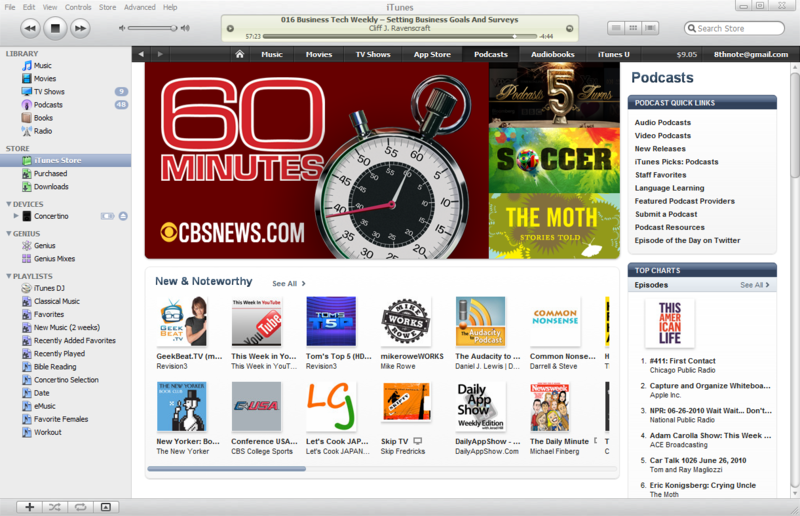 The Audacity to Podcast™ is 5th in iTunes' “New & Noteworthy”! A free Laptec mic that came with my computer and a passion to podcast was all I had to start. Sure, I also used Audacity and had a background in profession multimedia production. But it worked for starting out. I also used Levelator and simple bass-boost in Audacity to sound better. To make a pop filter, I got someone's old pantyhose (very embarrassing to do when you're a single guy) and wrapped it around a loop made out of a metal hanger. It worked decently. Don't talk too far away from the microphone. This catches more room noise and makes it harder to hear you. Don't talk too close to the microphone. This will result in plosives and clipping audio. Use a pop filter like the homemade one described above. Never touch the microphone or anything else touching it while you're recording! I had a great time working with Ewen from BagelTechNews to record some stuff for the Ramen Noodle™. Follow Ewen on Twitter and contact him to do some great voice work, and let him know that I recommended him. I'd love to know what workflows you have found that work with cheap equipment. Share those and any other ideas or questions by commenting below. Count me as one of the new listeners who found you via the mention on the iTunes homepage. Good stuff so far. I'm also interested in listening to your "Are You Just Watching" podcast. That one sounds right up my alley as well. I'll probably have some general podcast questions for you as well, although I have a feeling there isn't much more we can do to improve the quality of our podcast. Thanks for all that you do! Just finished your third episode after Cliff Ravenscraft mentioned your podcast on one of his Podcast Answerman episodes. Really appreciate the respect you have for each other. I see the two of you along with Ray Ortega, not as competitors but "complementors" to each other. With entry-level microphones, as one who supports faculty at a university, we often end up recommending headsets when instructors are recording content for their online courses (not lecture capture in front of a class but in the office). The advantage of headsets is the microphone "disappears" from their view so we don't encounter "microphone freeze" with the instructor looking at an external microphone. The selection of a headset and placement of the microphone are critical. We have found most headsets are of poor audio quality or poor fitting, making for an painful experience. One of the better headsets we recommend is the Logitech Premium Notebook Headset. It is lightweight for comfort, comes with a hard plastic case for transport and most importantly, it is an analog headset with a USB adapter. We have found the USB on many Windows systems to be of poor quality, so analog works best. For Macintosh systems and better Windows systems, USB is the better choice. For placement of the microphone, we teach faculty the "1 finger" or "two finger" rule. Passing one or two fingers between their mouth and the microphone with the microphone slightly below their lips seems to give the best placement, especially men with moustaches or beards. I've seen and worked with some fantastic headset mics before, but they were super-expensive. So if a headset is necessary, as seems to be the case for you, it looks like you found the best option within your budget.